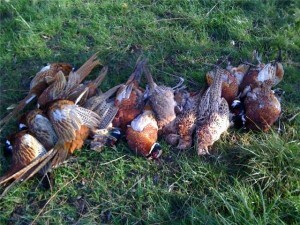 On Saturday, to my amazement, I actually shot my first pheasant. A friend had invited me to go on a shoot in the Essex countryside, something I’d longed to do ever since, as a teenager, I persuaded my mother to buy me a brace of pheasants to pluck, draw and cook. Rain had been forecast, but it turned out to be a glorious day: bright, cold and blue-skied. So we spent the day tramping around the countryside, through ploughed fields and meadows, and a small wood, and then standing around with our guns, waiting for the birds to fly up out of the bushes. I hadn’t been near a gun since I messed around with an air rifle in my parents’ garden, many years ago, and was a bit nervous. But it was exciting, and difficult. Somehow, towards the end of the day, when the clouds were smudgy and the trees spidery against the declining light, I managed to hit one, and it fell. 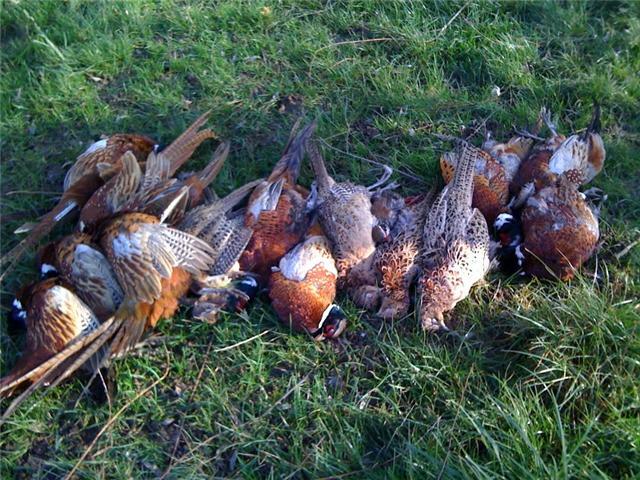 So I came back to London with some gorgeously plumed pheasants, which I hung outside my kitchen window, and the back of the house. I plucked the first one on Tuesday, on my doorstep. On Tuesday evening, my friend Xiaoming and I were cooking dinner for a bunch of colleagues, and I wanted to make a Chinese pheasant broth. I plucked, singed and drew the bird, and then did the Chinese thing: blanching it and then marinating it in Shaoxing wine, ginger, spring onion and salt to remove any unpleasant gamey flavours. Afterwards I brought it slowly to the boil in a big clay pot filled with water, skimmed it, and then cooked it very slowly for a long time with 黄芪 (membranous milk vetch root)，山药 (Chinese yam) ，龙眼肉 (longan meat), ginger, Shaoxing wine and Chinese wolfberries (a.k.a goji berries). It was a gentle, soothing soup, which my friend Rebecca claimed made her coldy, hoarse voice much better. We ate it as part of a meal that also included steamed chicken in lotus leaves, fish-fragrant aubergines, stir-fried lily bulb (百合) with beancurd skin (腐竹) and cashew nuts, mapo doufu (麻婆豆腐), steamed sea bass, water spinach with fermented beancurd, and stir-fried mushrooms. Sounds delightful! No buckshot on which to crack your teeth this time? What’s the pinyinized name for membranous milk vetch root? The english name is just horrid. Your descriptions here and in your books always get me salivating. Glad you can find the time to share your adventures this way. Thank you! Neil here from back in the tailorian Deli day. 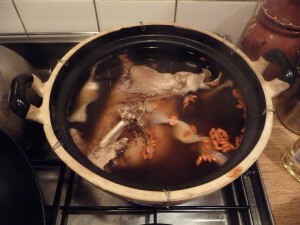 Was thinking about about putting on a pheasant hot pot and here you are! Gosh, what a voice from the past! Lovely to hear from you. That was really one of my favourite jobs, not only because of all the delicious food, but because of the endless fascinating conversation and hilarity! Funnily enough my younger brother ended up working there too, some years after me. You still in Oxford?